The blood tests are done to estimate the risk of Down syndrome. They may be done at about 11 to 14 weeks of pregnancy. Ultrasonography can help estimate the risk of Down syndrome and certain other chromosomal abnormalities. 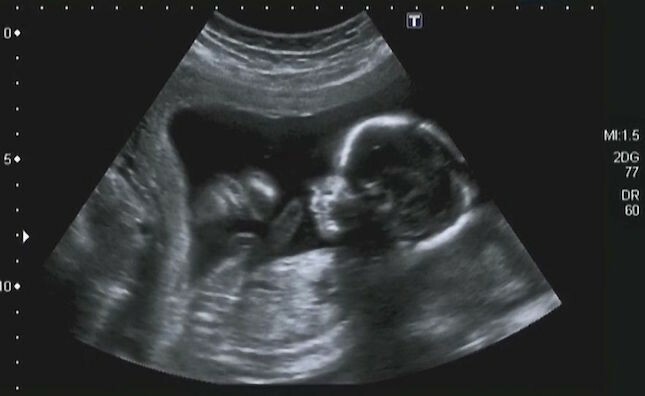 It can show whether the space at the back of the fetus’s neck is enlarged. If it is, risk of these abnormalities is increased. Alternatively, a blood test (called cell-free fetal nucleic acid [cfDNA] testing) may be done. For this test, small fragments of the fetus’s DNA, which are present in the pregnant woman’s blood in tiny amounts, are analyzed. This test can accurately determine the risk of Down syndrome and some other chromosomal abnormalities in couples with a high risk of having a fetus with a chromosomal abnormality. The test can be done as early as 10 weeks of pregnancy but can also be done later. First-trimester screening provides results early. If results are abnormal and the couple wishes, chorionic villus sampling can then be done early to determine whether Down syndrome is present. Amniocentesis can also detect Down syndrome, but it is usually done later in pregnancy. One advantage of 1st-trimester screening is that with earlier results, abortion, if desired, can be done earlier, when it is safer.